Transforming into a vegetarian may sound easy enough. For some, it indeed is, though for many, it might prove to be a tough call. There are a range of issues like weight gain, a sense of being full and so on that is usually associated with the transition to a vegetarian food habit. And if you are bogged down by any of these, you need not worry further as these points along with many more form the main points of discussion in this article. For some, giving up meat isn’t a big deal and they can do it right from the word go. For them, years of meat eating habit will be gone in a single day, never to turn back again. However, the same cannot be said for many with their own physical makeup being at fault. For them, making a drastic change in their diet can actually make them sick. 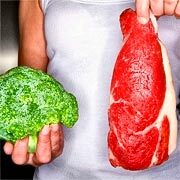 So if you are used to eating a lot of meat on a regular basis, making a gradual reduction in daily meat intake makes more sense, instead of its complete removal from your diet. This allows the body to cope up with the changes that you are putting it through. The two most common problems that new vegetarians face is a feeling of not being full enough and a lack of cooking ideas, not knowing what they should be cooking. At this point what new vegetarians will appreciate is the fact that beans can solve many of your problems and can well be your best friend, as perhaps is of many vegetarians. Not only are they an excellent substitute for meat in various recipes, they will also help satisfy your hunger cravings. Also the fact that beans are rich in fiber and proteins makes them equally essential to both vegetarians and meat eaters alike. There are many who adopt a vegetarian lifestyle but when it comes to actually eating vegetables, they would have none of it. For them, it is only carbohydrates and junk food that they believe is the ideal vegetarian diet. And if you belong to the same school of thought, you’re sure to put on a lot of weight unless you have an excellent exercise regimen in place. So while rice, pasta, bread or carbs are likely to feature in your diet, nothing should stop you from consuming plenty of vegetables. Also, it is important that you eat whole grain whenever possible. Tofu is an excellent source of protein, which makes it extremely suitable for vegetarians, as they may not get the same amount of protein from any other source. It is not that it’s a must for vegetarians to consume tofu since there are lots of other sources of protein, like eggs, beans or even protein powder to make shakes. However, it won’t be a good idea to rule out tofu until you’ve actually tried it. This, since there are some who enjoy tofu and have it regularly while some do not. It all depends on how you take it. If you find the going to be tough as a vegetarian, it’s probably due to a lack of new and interesting recipes coming your way. Since it’s all but natural to be bored after awhile if you are constantly gorging the same set of items day-in and day-out. A way out can be to look for new vegetarian recipes that are available both online or at bookstores. You can also talk to your vegetarian friends or family members about their favorite recipes, who can be of much help to you. And when you have enough of vegetarian recipes in your kitty, you can even return the favor sometime in the future. Some may find it difficult to move on to a vegetarian lifestyle, though the going can be smooth if you take into consideration some of these factors. And once you have settled down to it, pay heed to how your body responds to the vegetarian diet. Since if you do not feel comfortable with vegetarian diet, you may either have to rethink your decision or seek out medical advice. Thanks for the great tips. I’m sure they’ll help lots of people who are thinking of becoming vegetarian or vegan. My tip would be not to concentrate on what you’re not eating but to eat as many different vegetarian foods as possible and enjoy the variety of them all. Thanks for the healthy tips and I think its not all the time we need to be vegetarian.We still need to eat meat.